The Energy 202: Pruitt says flying first-class is safer. But some airline safety experts aren't so sure. Want more stories like this? Sign up here. The Environmental Protection Agency says that Scott Pruitt has traveled first-class on flights both domestically and internationally over the last year because it is simply safer for him. But neither representatives for the EPA nor Pruitt himself in newspaper and television interviews this week have fully disclosed the nature of the threats against him. The EPA is also refusing to release the written waiver that allows Pruitt to fly regularly in first or business class. On Wednesday afternoon, the agency backed away from its earlier statements about a single waiver, saying it actually submits the same security-related waiver for each trip Pruitt takes. The agency also has not spelled out the logic behind its rationale for the flights: Why does the EPA think first-class travel is safer than sitting in coach in the first place? Airline safety and security experts were left struggling to explain the EPA's rationale without a full explanation from the agency. One pilot was outright incredulous. Chesley “Sully” Sullenberger III, the retired pilot who once landed a damaged Airbus A320 in the Hudson River and who is now an aviation and safety expert at CBS News, had just this to say by email: "First class is not safer than economy." There is no reason to believe that sitting at the front of a plane is safer than sitting toward the back should the plane crash, said another aviation expert. "I cannot think of anything” that would make sitting upfront safer, said Harro Ranter, chief executive of the Aviation Safety Network. “In an actual accident, best chances of survival are usually in the rear." Security experts said there are a range of reasons why Pruitt and his staff might think paying for first-class is worth it when it comes to the administrator's safety. And some supported the idea that senior government officials might be better off paying for more expensive tickets. That argument suggests that sitting in first class means the official needs to interact with fewer passengers. As anyone who follows the news knows, there have been plenty of examples of unruly passengers clashing with flight crews and even one incident where Ivanka Trump was confronted by an angry passenger on JetBlue. But a few unpleasant interactions with fellow passengers isn't enough of a reason for taxpayers to pay a higher price for Cabinet officials' flights, congressional Democrats and even some Republicans said Wednesday. The EPA's inspector general has investigated some of the threats made against Pruitt, including "a threatening post" on Twitter from an Arkansas resident and an "obscene postcard" from someone from Ohio, according to E&E News. Gina McCarthy, Pruitt's predecessor as EPA administrator, confirmed to The Energy 202 through a spokeswoman Wednesday thar she did not receive waivers for top-of-the-line travel, despite, like Pruitt, making controversial decisions. Chris Lu, who as President Obama's White House Cabinet secretary served as the main liaison between the president and Cabinet heads, was unimpressed with the administration's rationale for Pruitt's travel. There's one more reason a Cabinet official may be allowed to buy premium seats. Government policy allows such purchases for flights of 14 hours or more so that high-level officials are fresh for meetings right after landing. “I wouldn't be personally obsessed with that,” Eric Schaeffer, executive director of the Environmental Integrity Project, said of international flights. His group sought information about Pruitt's travel through Freedom of Information Act requests. “But first class to La Guardia? Really?” he added, referring to a $1,641.43 ticket the EPA purchased for Pruitt to fly from the District to New York last June. — The latest on the Florida shooting: At least 17 people were killed when a 19-year-old gunman opened fire Wednesday on the South Florida high school from which he was expelled. Nikolas Cruz had been kicked out for “disciplinary reasons,” and was captured following a manhunt in the aftermath of the shooting, The Post’s Moriah Balingit, William Wan, Mark Berman and Lori Rozsa report. Cruz was booked into Broward County Jail early Thursday and charged with 17 counts of premeditated murder, per the Associated Press. Officials said another 14 people have been treated at hospitals, per the AP. Sen. Chris Murphy (D-Conn.) took to the Senate floor on Wednesday to call out Congress for not doing enough to address gun violence. "This epidemic of mass slaughter, this scourge of school shooting after school shooting," Murphy said. “It only happens here not because of coincidence, not because of bad luck, but as a consequence of our inaction. We are responsible for a level of mass atrocity that happens in this country with zero parallel anywhere else." — Oops: A White House climate adviser resigned after he failed to receive a permanent security clearance, The Post’s Juliet Eilperin and Brady Dennis report. George David Banks, who served in the role of special assistant to the president or international energy and environmental policy, is just the latest member of the Trump administration to leave amid scrutiny over background checks. "Banks, who, like a collection of other White House officials, had been working on an interim security clearance, said in an email Wednesday that that his application was denied after he admitted to smoking marijuana in 2013," my colleagues report. — How $225,000 can help secure a pollution loophole at Trump’s EPA: The New York Times has a front-page story about the preservation of a legal loophole by Trump's EPA that allows heavy-duty trucks to skirt emissions rules by using rebuilt 1990s-era engines. The Fitzgerald family, which sell the so-called "gliders" and advocated for the EPA to keep the carve out, "welcomed President Trump at one of its dealerships during the campaign, and it sells baseball caps with the slogan 'Make Trucks Great Again.'" Some Republican lawmakers were surprised by Trump’s pitch, The Post’s Heather Long reports, amid what she writes is a “growing rift” in the GOP about whether the tax hike is worth considering. Sen. Thomas R. Carper (D-Del. ), who supports the increase, said Trump “came back to the idea of a 25-cent increase several times throughout the meeting.” House Transportation and Infrastructure Chair Bill Shuster (R-Pa.) and the U.S. Chamber of Commerce are open to the plan, while Sen. John Barrasso (R-Wyo.) and Senate Majority Leader Mitch McConnell (R-Ky.) seem opposed. — Zinke moves forward with overhaul: Interior Secretary Ryan Zinke continues to push for a major reorganization of his department, reports the Associated Press, “despite growing opposition to his proposal to move hundreds of public employees out of Washington and create a new organizational map that largely ignores state boundaries.” On Wednesday, Democratic Reps. Raul Grijalva (Ariz.) and Donald McEachin (Va.) and other members of the House Natural Resources Committee charged Zinke with withholding details of the overhaul from lawmakers. “DOE plays a vital role in protecting our nation’s energy infrastructure from cyber threats, physical attack and natural disaster, and as Secretary, I have no higher priority,” Energy Secretary Rick Perry said in a statement. Trump asked for a $96 million boost in funding for the department to pay for the office and its expanded efforts. — Lavish purchases probed: The federally owned Tennessee Valley Authority is under investigation for purchasing corporate jets and a luxury helicopter used by Dallas Cowboys owner Jerry Jones, Bloomberg News reports. “The more than $35 million in purchases by the Tennessee Valley Authority come as the utility has been raising residential rates and is already $25 billion in debt." — Conservation groups vs. Trump: A group of environmental organizations filed a notice of intent to sue the EPA and U.S. Army Corps of Engineers on Wednesday over the delay of the 2015 Clean Water Rule. The Center for Biological Diversity, Waterkeeper Alliance, Center for Food Safety and Turtle Island Restoration Network charge the delay of the rule would gut protections for wetlands and waterways and would harm endangered species. 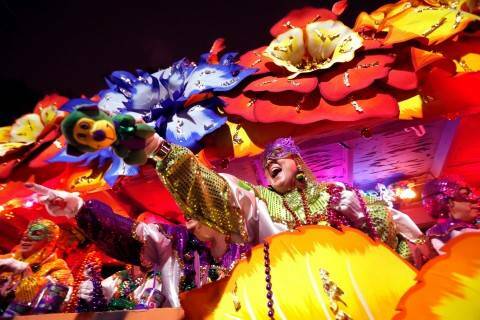 Mardi Gras produces days of merriment, indulgence, a few hangovers — and a lot of garbage. Once the parades have passed and the beads have been thrown, the cleanup begins. 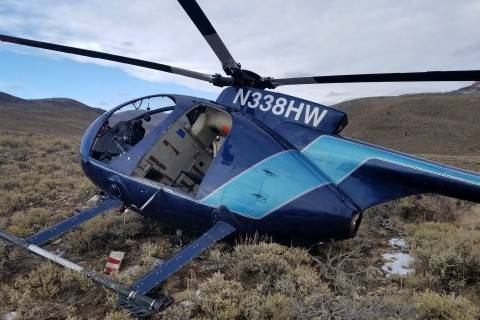 The case of an elk that died after it leapt in the air and brought a low-flying research helicopter down in Utah highlights the use of helicopters in wildlife monitoring, which has been criticized by animal-rights groups but praised as effective by wildlife managers. Hamm has been a friend of Trump’s since 2012, Sullivan notes. However, Hamm and Heitkamp worked together in 2015 to lift of the oil export ban. The Business Council for Sustainable Energy and Bloomberg New Energy Finance will release the 2018 Sustainable Energy in America Factbook.